There’s a lot of talk these days about whether women can “have it all” – the job, the family, the friends, the happiness. While I have plenty of thoughts on the topic as a full-time working mom (yes you can! why is this even a question? how come guys don’t worry about this? check those perfectionist tendencies at the door…) I won’t get too soapbox-y on you guys here because that’s not really the point of this blog. However…regardless of what you think about bigger “have it all” topics, you CAN have it all in this ultra delicioso snack. Who can resist salty-sweet-spicy-savory combos? I mean, really. I made these nuts awhile back for a party and had several requests for the recipe. I can’t take credit for the combo but the layered flavors are addictive beyond belief. Preheat the oven to 350. Brush a cookie sheet evenly with vegetable oil. Mix nuts in a large plastic bowl. In a small bowl or glass measuring cup, combine 2 tablespoons of vegetable oil, maple syrup, brown sugar, orange juice and chipotle powder and whisk well. Pour over nuts and toss to coat. Add 2 tablespoons of rosemary and 2 teaspoons of salt and toss again. Spread the nuts evenly on the greased cookie sheet. Roast for 35 minutes, stirring twice with a large metal spatula, until the nuts are glazed and golden brown. Remove from the oven and sprinkle with final teaspoon of rosemary and salt. Toss lightly with the spatula, stirring occasionally to prevent nuts from sticking as they cool. Let cool completely and store in airtight containers at room temperature for up to a week. With unseasonably warm weather reminding me that swim suit season is just around the corner (and I don’t have a prego bump as an excuse to opt out this year), I’ve been trying to eat healthier and limit my snacking. It’s obviously just a good habit anyways, but as a chronic light snacker it’s tricky. My sister, who seeks out healthy foods due to multiple food allergies, mentioned that she had been snacking on roasted chickpeas lately. 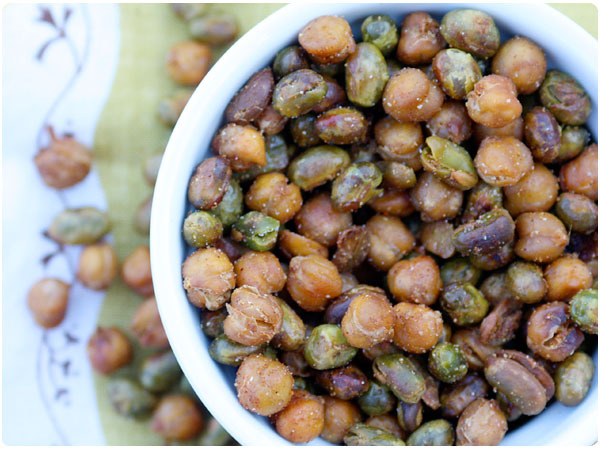 It inspired this easy, healthy snack mix that relies on zippy spices for big flavor. I’ll be able to keep this in my desk drawer at work and not feel guilty when those late afternoon munchies hit! Preheat oven to 400. 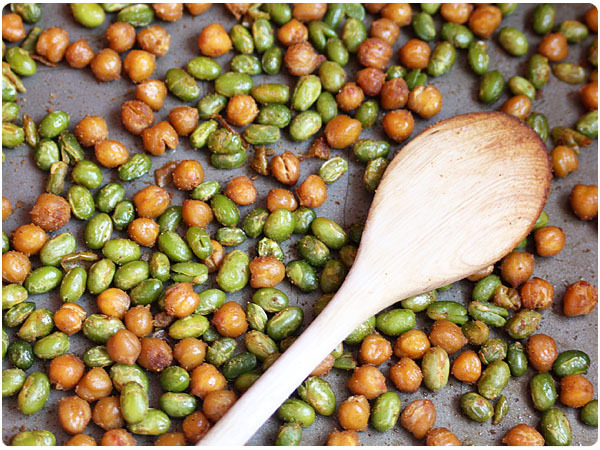 Drain and rinse chickpeas in a colander and mix with thawed edamame. Let as much water drain as possible while you’re mixing your spices, then dab legumes with a paper towel to make as dry as possible. In a small bowl, combine cumin, brown sugar, salt, garlic and chipotle powders. Transfer edamame and chickpeas to a medium bowl. Sprinkle spices over legumes and toss gently to evenly coat. Bake for 40-45 minutes, gently stirring every 15 minutes or so, until chickpeas are crispy on the outside. Let cool and transfer to a small bowl. Dust lightly with additional salt, chipotle and garlic if desired.